Estifanos Gebi of Atlanta prays in the interfaith chapel at Hartsfield-Jackson Atlanta International Airport on July 9. By Dionne WalkerAssociated Press WriterATLANTA - Ordained a United Methodist minister, the Rev. Chester Cook now has become a jack of all faiths. On a recent day, Cook welcomed a Christian-oriented Army chaplain, a Muslim family and a Buddhist ticket agent to his interfaith chapel at Hartsfield-Jackson Atlanta International Airport - a snapshot of the grab bag of faithful who make a stop in the chapel. Across the country, chapels designed to offer passengers refuge and reflection in bustling airports are making changes: removing denomination-specific decor, adding special accommodations and hosting services geared to accommodate an increasingly diverse group of travelers flying with faith. In Atlanta, it means a simple stained-glass window marking the entrance to the 1,040-square-foot chapel on the third floor. Inside there's room for 30, and a library stocking everything including Gideon Bibles and Jewish mystical texts. 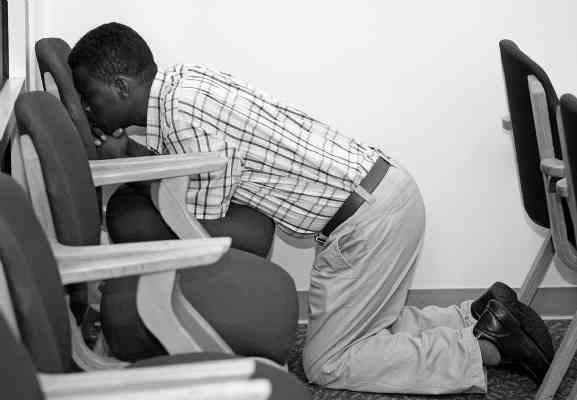 A large floor mat provides a cushiony spot to kneel for prayer; officials don't set it aside for any specific faith. "There are representations of almost every faith," said Cook, who recently oversaw a $200,000 renovation that more than doubled the chapel to its current size. "There are Buddhists in their orange robes, there are some Hindus. ... I helped a Wiccan one time." About 1,500 people per week visit the chapel, a fraction of the 250,000 people who pass through the world's busiest airport each day. The chapel remains unadorned to maintain its interfaith feel. "We try to help others be respectful in honoring the way someone else may practice their faith," said Cook, adding that Christmas decorations are kept to a minimum. On a recent Wednesday, baggage checker William Lowe stood, raised his hands and dropped his head for one of the multiple daily prayers he observes as a Muslim. Moments later, Army chaplain Al Spitler ducked into the chapel to thumb through a Bible and pray for guidance as he prepared to return to Iraq and his duties counseling fearful soldiers. "I could've done the same thing in a chair," he said. "(But) it's kind of a holy place, a private place." Removing the crosses and other typical markers of church to make others welcome might seem extreme in a more traditional chapel. But the nation's about 34 airports with chapels cater to a mixed community with a range of needs, according to the Rev. John A. Jamnicky, former chaplain of Chicago's O'Hare International Airport and a 20-year veteran of travel ministry. Airports also are looking to conserve space, said the Rev. Michael Zaniolo, chaplain at Chicago's O'Hare and Midway airports, and president of the National Conference of Catholic Airport Chaplains. "Instead of having four or five very small chapels, we've got one nice-sized chapel," he said, referring to chapels across the country. "And it's available for everyone." The airport chapel in Atlanta offers a one-size-fits-all religious experience. Spare rosaries, yarmulkes, prayer shawls and a Catholic Mass kit are tucked away for use as needed. A large compass on the chapel floor, meanwhile, was created with multiple faiths in mind. "We also looked at the direction of the chapel so that the north, south, east and west could all be clearly understood without using any religious symbols," Cook said, explaining that Jews, Muslims and members of other faiths face east for prayer. Maher Subeh, wife Ilham and children Bashar, 14, Zayd, 12, and Noor, 9, recently slipped off their sneakers and readied for prayer. Each folded their legs beneath them and solemnly bowed on the large chapel mat for a few moments, before grabbing their luggage for a flight back to Los Angeles. The Muslim family rarely sees chapels in American airports and was glad to have an alternative to praying in a corner of the crowded terminal among onlookers. "Sometimes they don't know what you're doing," said Maher Subeh, adding that after the Sept. 11 terrorist attacks the ritual gained uncomfortable attention. Cook smiled at the family as they trundled out, and a ticket agent who frequents the chapel to meditate slipped in.